The Kompac EZ Koat Web 15 HD is roll to roll UV & Aqueous coater capable of applying coating and primer. Whether digital output or flexo, each job will have the visual appeal, lasting durability, protection and rub resistant finish that your customers expect! Proudly made in the USA, the Kompac EZ Koat is built for 24/7 operation. The EZ Koat is the only UV coating system to feature Digital UV! Environmentally friendly, Digital UV replaces outdated & potentially hazardous ballast / mercury relay systems used in curing UV coatings. Exhaust/Vacuum System – Provides vacuum for additional sheet control, fume and heat ventilation, and cooling for 6kW option. Coating Agitator – Allows running UV matte and soft touch coatings. Cool UV – Add on for heat sensitive subtrates. The Kompac EZ Koat Web 15 is a small footprint, roll to roll UV & Aqueous coater capable of applying coating to on demand digital labels or cut sheets up to 14.5” wide by virtually any length. Whether digital output or offset, each job will have the visual appeal, lasting durability, protection and rub resistant finish that your customers expect! The Kompac EZ Koat Web 15i is our inline version of the EZ Koat UV & Aqueous coater capable of applying coating and primer inline with your printing or finishing equipment. This model includes substrate handling upgrades, including servo drives, for better control of higher speed web applications. Coating unit automatically retracts out of the way for when no coating or priming is needed. Additional custom support for your specific configuration available. Whether digital output or flexo, each job will have the visual appeal, lasting durability, protection and rub resistant finish that your customers expect! Stock Weight: 7pt. to 30pt. 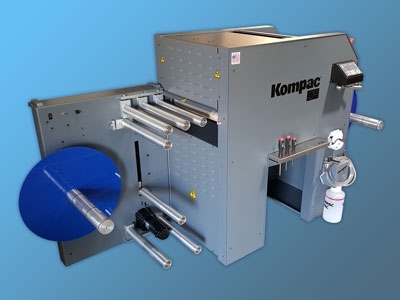 The Kompac EZ Koat Web 20i is our inline version of the EZ Koat UV & Aqueous coater capable of applying coating and primer inline with your printing or finishing equipment. This model includes substrate handling upgrades, including servo drives, for better control of higher speed web applications. Coating unit automatically retracts out of the way for when no coating or priming is needed. Additional custom support for your specific configuration available. Whether digital output or flexo, each job will have the visual appeal, lasting durability, protection and rub resistant finish that your customers expect!